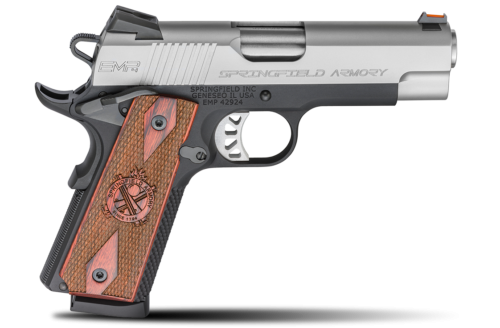 Springfield Armory introduced their new 1911 EMP Champion chambered in .40 S&W earlier this year. This new 1911 option provides a 1911 option to one of the most popular law enforcement cartridges. 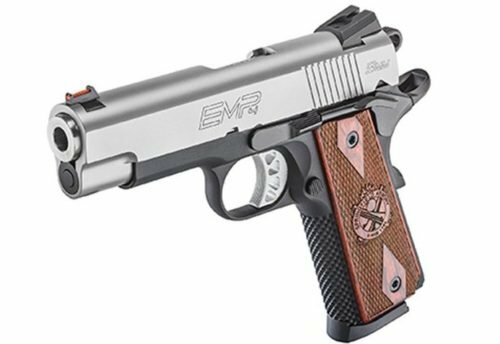 The new Springfield Armory EMP .40 S&W is made from high quality materials, with several upgraded features coming standard. The Model 1911 has seen a very pleasant surge of popularity this decade, partially due to the 100-year anniversary of this American icon firearm. With this 1911 from Springfield Armory, law enforcement agencies and officers may be able to combine a cherished pistol design, with the .40 S&W cartridge already being used in the field. Springfield Armory® engineered the original 1911 EMP® with an all-new patented short action. This new EMP® is smaller, and a more concealable handgun optimized to shoot the smaller 9MM and .40SW calibers. The new pistol is not just a re-calibered handgun, but instead the culmination of (17) re-designed parts. The EMP .40 S&W is specifically designed for the smaller cartridge and not simply a modified .45 ACP. The all-new Champion™ offers a longer 4″ barrel providing an increased sight radius for improved practical accuracy. In addition, the longer barrel will produce higher velocities across a wide range of ammunition. The new EMP® Champion is also an extra 0.5″ taller, giving the shooter a strong and positive grip. The EMP fiber optic front and low-profile 2-dot rear sights are great features. Springfield’s EMP .40 S&W comes with a fiber optic front sight and two-dot, low-profile combat rear sight for faster target acquisition. Ambidextrous safety levers, a match-grade barrel, and Posi-Lock™ grip texture (dimples) to the front strap are additional benefits for the serious shooter. The two-tone forged stainless steel slide and Carbon Steel Black Armory Kote™ frame on the .40 S&W model give the EMP® a very attractive appearance. The 1911 EMP Champion in .40 S&W packs (9) rounds plus one more in the chamber. That’s in the same reduced grip circumference, not a double-stack design, that made the original so successful. The EMP Champion grips are made of very attractive Cocobolo wood grips. 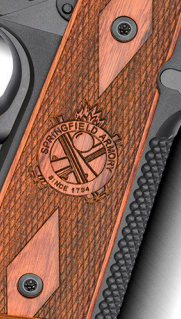 The grips come with an etched Springfield Armory emblem, in addition to an aggressive but comfortable checkering. The Cocobolo wood grips are very attractive. 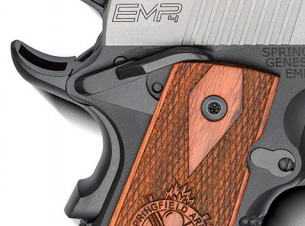 Springfield Armory did not forget key features of the 1911 in their EMP Champion design. The beaver-tail grip is extended for more positive recoil control while being machined in the middle to reduce unnecessary weight. 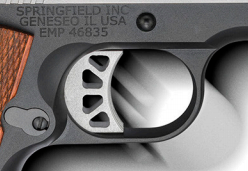 The combat-style trigger has aggressive texture on top, and is also machined for weight reduction. The trigger is set for 5-6 pounds of trigger pull with a smooth pull and crisp break. Cosmetic machining on the trigger adds to appearance appeal and weight reduction. The machined EMP trigger has a 5-6 lb. pull weight. The Springfield Armory EMP Champion has an ambidextrous manual safety, which is an outstanding feature for off-hand or transition shooting. The magazine release is designed to be reversible to accommodate left-handed shooter. Ambidextrous manual safety levers increase versatility in shooting scenarios. The new Champion EMP .40 S&W if a very attractive handgun. The new Springfield Armory 1911 EMP Champion chambered in .40 S&W presents a very attractive option for police use. Though the number of agencies, or individual officers carrying the Model 1911 is a much smaller today than in years past, the pistol still maintains a favorable opinion in many minds. The new chambering in .40 S&W opens a large door to modern law enforcement use, where the .40 S&W is still the most widely used handgun cartridge. With this new EMP pistol, agencies and officers could legitimately choose the EMP Champion without having to consider a caliber change. Officers in today’s environment need to be prepared for horrific acts of terrorism, armed confrontations, and even planned attacks on officers themselves. As such, BlueSheepDog would caution selecting the EMP as a primary patrol duty sidearm, due to its limited capacity of 9+1. However, the EMP .40 S&W could be a viable sidearm option for administrative officers, and perhaps detectives with a proper vetting process. In addition, the EMP .40 S&W would make a very attractive back-up or off-duty handgun.